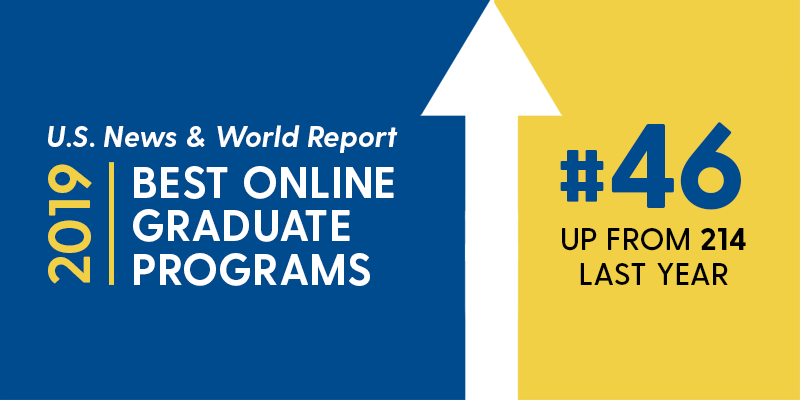 The University of Delaware’s College of Education and Human Development (CEHD) rose 168 places to #46 in U.S. News & World Report’s 2019 Best Online Graduate Education rankings, which were released on January 15. The survey ranked a total of 299 online graduate programs across the nation. CEHD offers four online master’s degrees in Literacy, Teacher Leadership, Educational Technology, and Exceptional Children and Youth. For this ranking, U.S. News ranked schools based on five general categories: student engagement, faculty credentials and training, student services and technology, expert opinions from high-ranking academic officials, and student excellence. Within these categories, U.S. News accounts for a variety of factors, including graduation rate, class size, time to degree, student indebtedness, support services and teacher preparedness to teach distance learners. CEHD’s programs scored highly on student services, technology and engagement. These elements are of particular importance to students who are considering an online program. They want to know classes will not just be static lectures, but interactive between faculty and students. This ongoing engagement through multiple digital platforms ensures that students develop specific knowledge and skills that positively impact their careers. Enrollment in the online graduate program averages about 100 students with an average class size of 25 students. The graduation rate is 89 percent. Based on data from Join Delaware Schools, a nonprofit supported by the Delaware Department of Education, graduates can recoup their investment in about five years. The College’s on-campus graduate program is currently ranked 34th in the nation in U.S. News’ Best Grad Schools 2018 edition, placing it in the top 14 percent of programs evaluated. Students in our graduate programs can earn doctoral or masters degrees in both our School of Education and department of Human Development and Family Sciences. We also offer interdisciplinary graduate degrees in collaboration with the business and health sciences. To learn more about graduate degrees available through the College of Education and Human Development, attend our on-campus Open House on Wed., Jan. 23 from 5:00 to 6:30 p.m. or Online Master’s Virtual Open Houses, Feb. 4, March 5 or April 9. For more information on rankings by US News & World Report, click here.